Winterfest is a full park event, where we offer Holiday themed shows and midway characters that roam the park. Are you a singer that has a good dance background? We are seeking singers for our trolley show and A Capella singers for our midway shows. Outgoing? Fun? Love being a character in everyday life? Then this is the place for you. We are seeking high energy actors that can interact with guests. Characters include: Jack Frost, Scrooge, Gingerbread Man and many, many more! Performance dates: November 23rd-December 30th, Fridays through Sundays with weekday performances near Christmas. 4701 Great America Parkway, Santa Clara, CA. Singing auditions start at 7:00 PM with acting at 8:00 PM. Please arrive at least 30 minutes early to fill out paperwork. Please bring a head shot and resume stapled together. 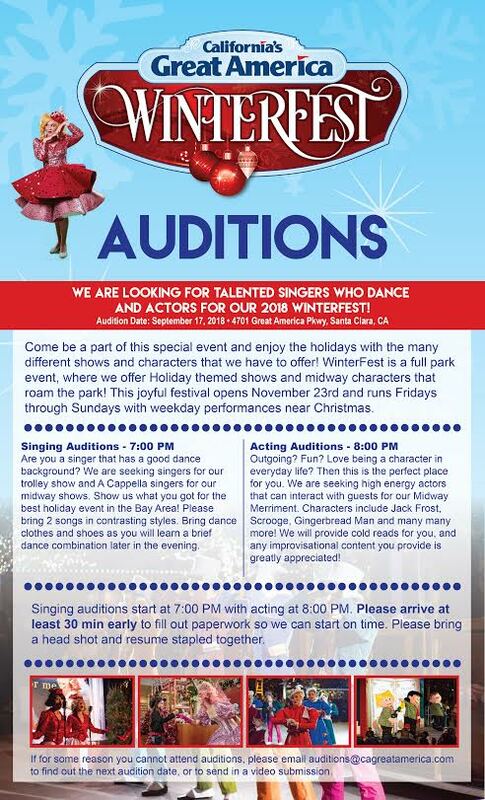 If for some reason you cannot attend auditions, please email auditions@cagreatamerica.com to find out the next audition date, or to send in a video submission.